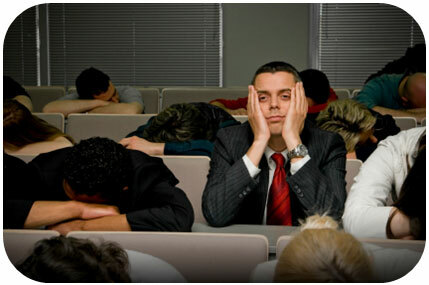 The best part about forgettable presentations is they take very little time to prepare and it does not matter what the speaker says as no one is listening anyway! These tips are free so use as many of them as possible in your next presentation – that way you will more effectively help your audience learn more in less time. This “tongue-in-cheek” article is one in a series from iSpeakEASY. We help people present information in an exciting and relevant manner – usually by helping them avoid the mistakes discussed here. Contact us for information on workshops and coaching. Visit us at www.iSpeakEASYblog.wordpress.com. You have agreed to make a presentation at a staff meeting. You take time to outline your talk, prepare your handouts, and create effective visual aids. You practice. You confidently walk into the room wearing jeans and a button-down shirt expecting to see a table with 6-8 people. As you enter the room though, you find there are close to 80 people sitting in an auditorium. They are dressed in business attire. There is a lectern on the podium with a microphone and a large screen behind. The paradigm of your presentation suddenly changed. It requires different preparations, more handouts, and an entirely different presentation strategy. In an instant, you go from feeling confident and prepared to scared. Your mind flashes back to when you were invited to speak. You wonder what you were told, what you heard, and suddenly wish you had asked a lot more questions. The very first part of preparing for a presentation is to define the parameters. How many people will I be addressing? Who will be in the audience and what is their background? What do you hope to accomplish by having me present to your group? Is the audience a group of strangers or do they know each other? What other speakers are on the agenda and when will I speak in relation to them? What type of AV equipment and software do you have? Will there be technical assistance available? What is the appropriate dress for this occasion? What is an emergency number I can call the day of the talk in case I have a problem? Don’t assume you understand the parameters of a presentation. Make sure you ask the right questions. Find out as much about the situation as possible before you begin preparing. The more you know about what to expect, the better prepared you will be. Your confidence and credibility will soar. © 2010 iSpeakEASY. All rights reserved – This speaking tip is one in a series provided by iSpeakEASY. We help people profit from their words. Call for information on individual coaching or group workshops. More tips can be found at http://www.ethanrotman.wordpress.com. We all want to be good speakers. We all want to feel comfortable, look credible, and mostly, have people heed our advice when we speak. After all, the reason we make presentations is to change behaviors, attitudes, or beliefs. There is no magic to improving your presentations, just time and effort. All speakers, regardless of their abilities or level of nervousness, can improve if they follow these 4 steps. Make Time To Prepare – There is simply no way around this: it takes time to create a strong presentation. It is easy to procrastinate thinking that since you know your subject and will just be talking; you do not need to prepare. To have a strong presentation, you must allow adequate time to think, create visual aids, and practice. Organize Your Presentation – A good presentation has a beginning, middle, and an end. It is clear to the audience where you are going and what you hope they will do when you done. Taking time to plan your talk insures you will cover all the needed material while avoiding confusing (and irrelevant) side stories. Create Compelling Visuals – While it is easy to create text heavy slides and bulleted lists, all they compel the audience to do is space out. Design your visuals so they show the audience in images the ideas they are hearing with your words. Involve Your Audience – Audiences want to be active participants in a conversation, not passive receivers of information. Engaging and involving the audience makes it easier for them to pay attention and retain information. Asking questions, eliciting comments, and dividing the audience into small discussion groups are ways to engage the audience. The net result of doing the four items listed is that you will feel more confident as a speaker and audiences equate confidence with credibility. The more confidence you exude as a speaker, the more relaxed the audience will be, and the more they can listen to your words. Confidence alone is not enough to carry your talk – you still need to be organized, deliver your talk well, and have good subject matter expertise. Your talk will be more compelling, you will feel more comfortable, look more credible, and your audience is more likely to take the action you are suggesting. It is not magic, it is not rocket science – it is just 4 things you can do to improve your talks. Your credibility (and that of the company you represent) is on the line each time you speak. You may be full of passion, have a wealth of knowledge, and be the best at what you do, but this will be lost if you lack the skills to present these ideas. Your competitors gain when you have weak presentation skills. While this was not her topic, this was the message she delivered. And she delivered it effectively and definitively. “If this was a smaller group, we would have time for you to talk and share. But since it is so large, I want to make sure we have time to go through all the slides”. Speak non-stop for an extended period of time. Have your cell phone ring during the presentation. Yes – the speaker really did all these things (and more) in one presentation. While her words told a story of the great services her company offers, her actions left a different impression. Regardless how much new business her company may have gained as a result of this presentation, they would have gained more if they backed up their superior product with a professional presentation that enhanced their credibility. At the end of the presentation, there were still a lot of “undecided” prospects -there was still a lot of money on the table. I hope you do better in your presentations than this woman and that you better match the words you say with the message you deliver. A client told me she was disappointed in the speaking skills training session as she did not feel her skills had improved as a result. Listening to her, I did have to agree. She had attended a 1-hour introductory talk and applied little, if anything, to her repertoire. Her expectation was that if she attended a single session, she would have the magic elixir needed to bring her to perfection. Even the best speaking coach cannot deliver that level of excellence. If you believe you can attend a speaking skills workshop and become a “perfect speaker”, forget it. Please don’t attend as you will leave disappointed. It would be better for you to sign up for your local Toastmasters group where you can attend weekly meetings and receive lots of positive feedback on your speaking skills. In time, you will come to believe you are, indeed, perfect. If you participate in an iSpeakEASY workshops (or one lead by another speaking coach), you may learn that speaking is a complicated art with many variables. You may walk away at times frustrated that there is so much to learn. You may realize that much of what you have been doing for so long is not right. You may learn that speaking well takes work and concentration. You may discover that you will never become a “great speaker”, you may however, become a much better speaker. You will become a person that has knowledge and skills that when applied, can reap great benefits. iSpeakEASY workshops (and the workshops of all credible speaking coaches) provide a foundation of information and ideas. You will be exposed to new ideas and new ways to think about your entire presentation. You may discover the importance of small nuances, or that what you want to say has little bearing over what the audience needs to hear. You may never become excellent – you should however, expect to become much better than you are right now. You should expect to see an increase in your effectiveness (by whatever means you choose to judge), you should expect to become more engaging, a bit more relaxed, and able to enjoy your speaking. Perfection as a speaker, as in all things is a goal to strive for. You may never reach the goal but you will get much closer to it the more you learn and try. 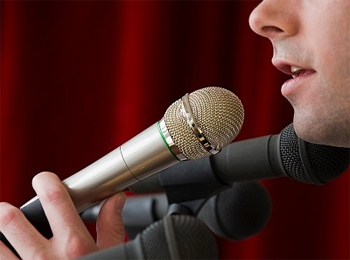 Of course, if you want to learn to be a better speaker…enroll in the Speakers Academy. “The KEY to being a good speaker” Kurt told me, “Is to feel comfortable in who you are – to feel comfortable in front of a group. I have been through years of Toastmasters and read Dale Carnegie – that is what I learned”. A few moments later, Kurt was introduced as our speaker. He sat in his chair at the front of the room and he looked very comfortable. He rambled for about 20 minutes without really saying anything of substance. He did not address the topic that was promised, he bounced from idea to idea, and no one in the room looked enthralled. But Kurt was comfortable. Kurt confused his comfort and lack of nervousness with being effective. A speaker should have a goal, or a reason for speaking. At the end of the talk, there is something the speaker wants the audience to know or do. If Kurt’s goal was to impress the audience that he was comfortable speaking in public, he succeeded. If he wanted us to know that he was a good speaker, that he was competent in his work, that his company was worthy of our business, or that we should follow his advice, he failed wonderfully. An effective speaker feels comfortable because they know they have a strong presentation: a well crafted message that is expertly delivered. They know they have a reasonable chance of changing attitudes and behaviors with the audience. As a speaker, when you know your topic, have clear goals for your talk, excellent visual aids, and are well practiced, you will feel more comfortable in front of an audience. When a speaker believes lack of nervousness alone makes them a good presenter, they are suffering from Kurt’s syndrome: confusing personal comfort with effective speaking. The speaker’s level of nervousness has little to do with their ability to motivate an audience to take new action. Kurt is good at his job and he works for a very reputable company. I hope one day he learns the benefits of speaking well. He will be seen as credible, competent and his business will thrive. “Techniques and skill and even a point of view are often handed down, formally or not. It’s easier to get started if you’re taught, of course. 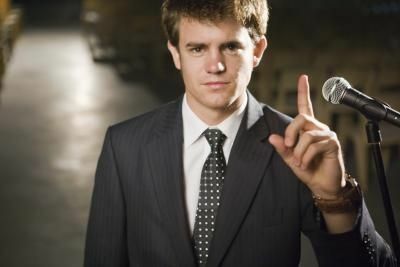 “There is an art and a science in public speaking. Any one can learn the the techniques of being a a good presenter just as anyone can learn to stretch canvas and mix paints. Few of us, however, will become a Picasso.